Our Suzuki program offers private instruction with the very essential dimension of group classes as Dr. Suzuki intended. All students in our program must attend group classes, we do not allow students to miss group classes due to extracurricular activities. The group class is a key ingredient in motivating students as well as providing a chance to review old repertoire. 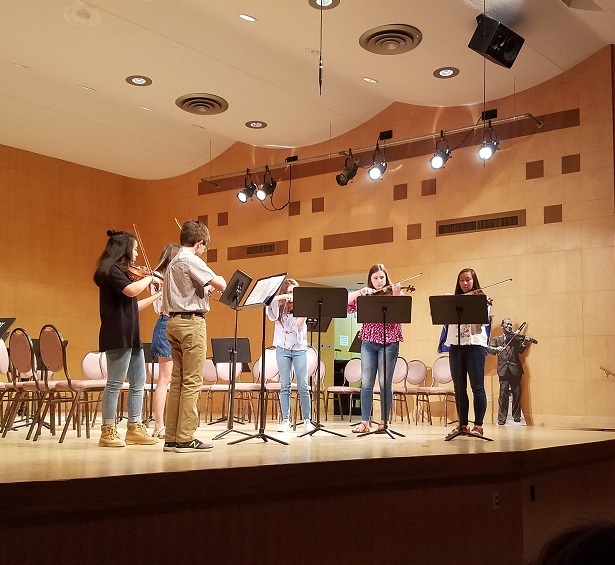 Students who continue through high school learn that the many years of a peer support group, concerts, solo recitals and workshops offered through the CSS helped keep them interested. This class utilizes fun games and materials designed by Michiki Yurko in her books “No-H-in-Snake” and “Music Mid Games”. Children learn basic rhythms, note values, note names, dynamics, etc. The skills are taught through the use of bingo cards, “jell-o” sticks, beanbag notes, “musopoly,” and various other games. These concepts work together to teach music theory and create music literacy like never before! 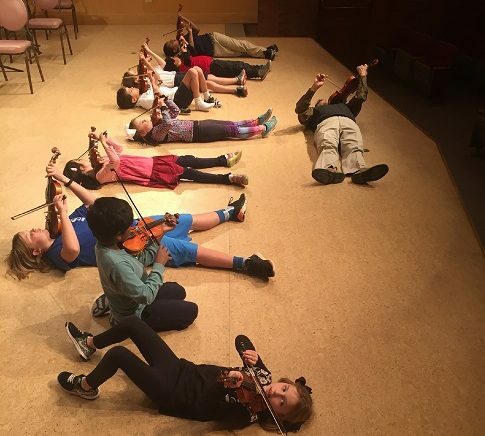 The basic music skills are a prerequisite for participation in the Elementary Orchestra or Reading Class. This is the first class where the students read music using their instruments and playing in unison. The reading class develops music literacy in a creative setting including composition and improvisation too. The repertoire of the class is comprised of a selection of more than 50 short pieces from several reading books, with elaborate piano accompaniments. Elementary Orchestra is the first experience playing in an orchestra. 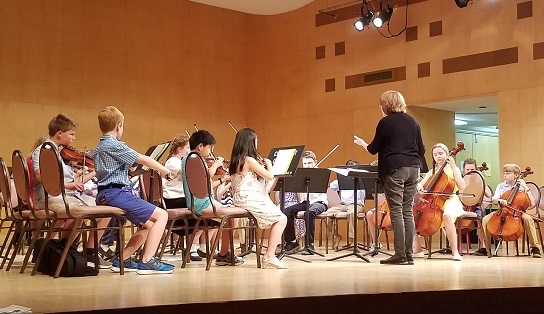 Intermediate Orchestra involves those who have had note-reading exposure and are ready to further develop their reading abilities in a higher level orchestra. 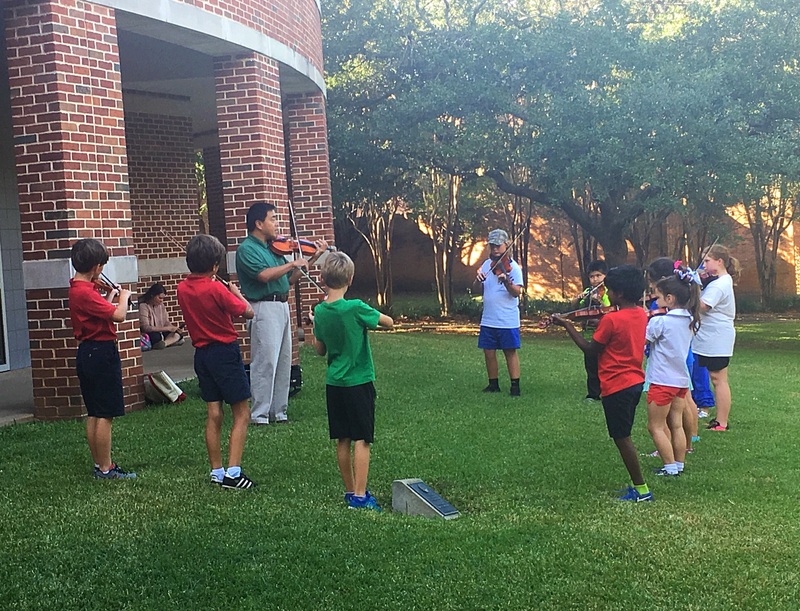 Elementary orchestras have 2nd to 4th graders and Intermediate Orchestra consist of students from 5th to 8th grade. This most advanced chamber group in our program, most students are 8th grader or above who are ready for more advanced music that is in the upper positions and utilizes more complex rhythms. On Tuesdays afternoon, we offer 11 different group classes. The student placement is based on their current Suzuki repertoire level during the beginning of the year. Students will remain in the same group classes until the end of the school year. The main purposes of the group classes are: to work and reinforce technique, to become musically flexible, to improve direction-following skills, to instill discipline, to become a better audience, to work together as a team, to offer and receive constructive criticism, and to prepare for performances. This is for our violin students who have finished Book 8. Challenging violin ensembles and show pieces are performed. Students are often in high school, although there are exceptions with those who have reached these levels earlier. This group allows our most advanced cellists (Books 6 and above) the opportunity to play interesting music arranged for multiple cellos, ranging from Bach, country, Hebrew, Irish, etc. This is for our most advanced violists and it allows for complimentary pieces to be played, usually in 3 or 4-part harmony. Summer is a great time to learn more music since there is no school or homework! Most of our students keep a routine going by taking regularly scheduled private lessons over the break, it helps to maintain all the work accomplished during year. Please talk to your teacher to check their availability. If your teacher is gone much or all of the summer, several other teachers are available to give additional lessons. We urge you to study with your normal teacher, supplementing with other teachers as needed. Summer lesson forms will be available through your private teacher beginning in May and must be paid through the Centenary Website or the Hurley Music Office by June 1st.